As Savage Dragon marches on toward #250, the series had a minor time-jump in this month's #243. Not something that changes the face of the series, but just enough to get us caught up since the comic happens in real time and the last few issues have happened back to back to back in the in-story timeline. The issue sees Maddy Dragon facing off against a giant monster, Amy Dragon facing off against a supervillain, and a ton of property damage to private residences. Along the way, we get more insight into what Angel has been going through, and a new addition to the Dragon household. All that plus a departure (of sorts), crammed into an issue where Malcolm barely appears and yet the antics of the rest of the Dragon family make the title feel as vital and action-packed as it gets. As usual, series creator Erik Larsen joined ComicBook.com go discuss the issue, and speculate with us about what the big changes of the month mean for what's next with the characters. 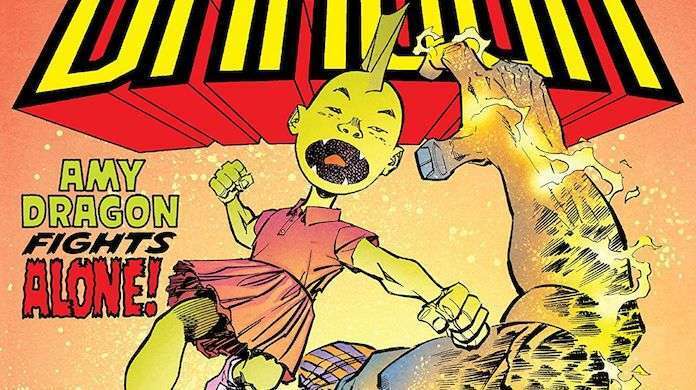 There are spoilers ahead, so if you have not yet read Savage Dragon #243, go grab a copy at your local comic shop or buy one digitally from ComiXology, and come back to run through it with us. Poor Kevin — I feel like he just never gets a break. Will he be off the board for a while or is this just a standard superhero combat hospital stay? Because the book is set in real time — it’s going to seem as though he’s instantly better, despite having spent a considerable amount of time in the hospital. The nature of the book is that a lot of events end up bumping into each other and then I have to skip ahead a few months at once in order to get the timeline back on track. It seems to me that Angel is really having a hard time finding herself, post-Malcolm. Is it arguably a really bad sign that she is not willing to follow Frank back to Chicago? She feels very connected to Malcolm and Maxine and Jackson is her son—so it’s not that simple. There’s also some question about whether she’s even welcome back in the States. She was abandoned in Dimension-X after all, along with her mother and Alex Wilde. They were considered aliens, having traveled to this earth from another. So there are a lot of factors for her to consider. What is her relationship with Alex Wilde at this point? Because she notes that they are “rooming” together, but post-Dimension X I felt like the relationship had gotten more intimate than just sharing a kitchen. Her relationship with Alex in Dimension-X was pretty much any port in a storm. There weren’t many options there and the two were seeking whatever comfort that they could find. The paramedics whisked Kevin off. Why weren’t the police called in after the attack? I’m assuming they were. I’d actually drawn some police in, milling about but it all just seemed weird given the number of jump cuts. They would have been included in a panel or two and I figured—they could just as easily have been off-panel and we missed them. That seemed better than having them appear and magically disappear between panels. By the time Malcolm shows up quite some time has passed. Maddy’s been cleaned up, the kids have moved on to watching cartoons and Frank and Laila are gone. Had the police been depicted they could possibly have been squeezed into one or two panels on the previous page and it just felt unnecessary. When Maxine is screaming about needing sleep, there is a bit of her body language that plays for comedy. Is there a line that you have to walk there, allowing the visual to be what it is without undercutting the seriousness of what’s going on with Maxine at this point? To a degree. She’s a very animated person. She gesticulates a lot and has exaggerated body language. That doesn’t all change just because she’s been through a traumatic experience. And again—real time becomes an issue. She could see her psychiatrist 30 times between pages but we can’t be privy to all of them and be current. A lot of things need to be cut due to space concerns. And that can mean pretty abrupt total shifts at times. A necessary evil. Was there a huge time shift between pages? Maxine is sick in bed on one page and on the next she’s driving Amy to a party and her hair is considerably longer. Yeah. Big jump there. I though there were enough visuals clues for readers to catch on that a couple months passed between pages. The last few issues all piled on top of each other as one story spilled into the next. Hell, the opening pages in this issue still take place in the snow! I feel like Captain Tootsie’s role has become an interesting one. Has your idea of him shifted as it’s gone on? He’s become something of a Rex Dexter type. The character was smart enough to build his own spaceship back in the ‘50s, so it made some sense that he’d be a pretty smart guy. Given that the Secret Legion were traveling around in his ship—it made some sense to stick them up in Canada to avoid the anti-Alien sentiment back in the States. Once in Canada, I thought it’d be good for him and the kids to stick around. He’s something of a wildcard because I really don’t have a lot in mind for him at this point. Greta seems like an ideal addition to their life, since Maxine is so overwhelmed and exhausted. Still, it seems like a dangerous proposition to have one of those around. What do you think will happen first, Greta going bad or Maxine trying to make a move on the Perfect Woman? I don’t imagine Maxine would treat Greta as anything other than a robot. Maxine has to be somewhat concerned about her even being there. Certainly Greta could rip her frail meat body in two without much trouble. At the same time—if Greta can just keep Maddy from accidentally executing her—that would be a win. The family really needs as much support as they can get. Malcolm can’t be there every waking moment and if Angel is going to maki=e things difficult—Greta may be their best option. Is Amy's adventure the end of Walden and company, or might we still see them even though the show is over and their house is destroyed? Walden will be back. Amy has made a friend and he’s always up for finding some other avenue for exploiting the Dragons for his own financial gain. Celsius has a very Golden Age design. I actually checked the Public Domain Superheroes Wiki to see whether he was somebody with ties to Captain Tootsie. What’s his deal? Just another new character created to face Amy Dragon in battle. Captain Tootsie didn’t have a lot of real villains that he fought. In his Tootsie Roll one-pagers he mostly solved problems and in his own book, thwarted aliens and went on adventures.